Artist Rafa Esparza adds detail to one of the portraits exhibited in staring at the sun. Esparza works with adobe instead of canvas. Photo courtesy of Mass MoCA. Curatorial designs in museums are streamlined, prompting visitors to approach new exhibits with a certain expectation of the presentation they will experience. So, even when the artworks themselves are unknown, museum-goers know that the system of presentation will be familiar. Paragraphs with contextual information and, often, a justification of the curator’s vision lead people through the gallery on placards in 10-point font. The walls are painted, the floors are polished, the art itself – aloof and precious – has a radius of unapproachability that a guard will inevitably have to rebuke a child for violating. Rafa Esparza’s exhibition staring at the sun, which opened at MASS MoCA on Saturday, busts open this model for viewing art. The paintings that hang on the walls are not on gold-framed canvases but on blocks of adobe (a building material meaning “mudbrick” in Spanish). Not all the blocks of adobe are painted on – some are kept blank, leaving the viewer to examine a cracked, brown surface of dirt. In a wonderfully vital and evocative move, the floor is paved with adobe bricks in place of polished wood. “It’s such a strong signifier in terms of it being a color,” Esparza said at the exhibit’s opening on Saturday. This significance comes across in the paintings, portraits of his loved ones; the brownness of the subjects’ skin interacts seamlessly with the brownness of the adobe. It is only their clothing, or some other artistic embellishment, that feels painted on. Indeed, in its one small gallery, the brownness of Esparza’s adobe seems to lay bare the entire art world in all of its assumed curatorial ascendancy as a sphere submerged in whiteness and in wealth. Importantly, however, Esparza has stressed that brownness is “a spectrum.” As he put it to Artforum’s Kate Green in a 2017 interview, “When I think of brownness, I think of an expansive and generative space of inclusion and amplification.” This way of seeing the brownness of Esparza’s art powerfully activates the whiteness of the walls that surround it in the exhibit, turning them from a default background into a forceful, complicated presence. Esparza also highlighted the collaborative nature of much of his recent work with adobe, noting his seminal collaboration with his father, who taught him to make the bricks featured heavily in his work. The Mexican-American artist, who identifies as queer, had a difficult process coming out to his family. When Esparza asked his father to teach him the trade he had worked in Mexico, adobe-making became the way they began to reconnect and heal their relationship. “There’s a lot of learning of personal history through this work,” Esparza said. Whereas the materials used in classical artworks tend to be a means to an expressive end, Esparza’s materials are meaningul beyond their mere appearance, the composition of his canvases as relevant to the artwork as the paintings themselves. The water in the bricks comes from the Hoosic River, the same stream that gurgles outside the exhibit’s walls, and the manure and hay come from Hancock Shaker Village, a 45-minute drive from MASS MoCA’s campus. 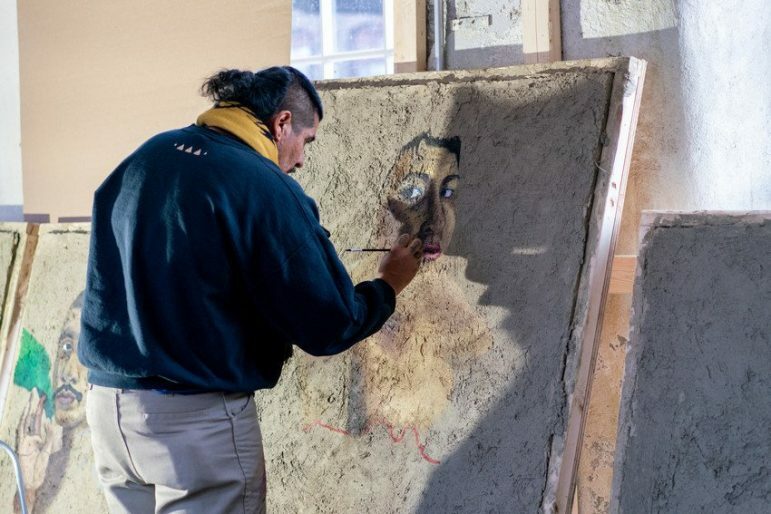 Working with such local materials, Esparza said, lends precious “moments to meditate on what this land is.” The adobe on the walls, much of which is bare, demands to be seen as art, as does the adobe on the floor. “[I wanted to] have every step be a decision,” Esparza stressed. In two spots on the floor of the exhibit, Esparza has stacked bricks in four directions to enclose a small patch of dirt, and growing out of one of the patches is the small, beautiful stalk of an onion plant. “We like to think of gardens and plants as conduits that connect us back to places where we’re from,” Esparza said. However, the onion was an unintentional addition to the space; it grew out of the brick entirely on its own, which Esparza thought was lovely. “[It] felt like a good omen,” he said.